There are two more obstacles to doing yoga in the house. Two sweet, furry, opportunistic obstacles. As soon as I roll out my yoga mat, it's open season for wrestling on the floor. So, we wrestle on the floor (because the stay-put-while-snuggling policy also applies to active playtime), and then I can do my yoga. "Yoga" might translate to "watching TV while propped on pillows" sometimes. As you'll notice, Niki is smack-dab in the middle of my yoga mat, comfortably snuggled between bolsters. The best way that I've found of dealing with this is to first take pictures, then to snuggle up next to him, give him a few belly rubs, and wait a few minutes until he gets bored with my neediness and changes location. He calls this pose "sad and unloved dog". Don't be fooled by those big, brown eyes. Lest you think that once Niki has been sufficiently snuggled, the obstacles to practicing yoga at home are over, that's only half of the issue. I have *two* dogs, if you remember. Two dogs who have learned to work cooperatively. Once I start warming up and going through poses, I have Elphie walking across my mat, underneath me in downward dog, weaving around my feet in squatted poses, and my personal favorite, curling up in the open area when I do supta baddha konasana. I call this "agility yoga", where I am the agility course. It's mostly funny, but it means that if I were *able* to do handstands, I couldn't do it in the house for fear of falling on or accidentally kicking one of the dogs. I'm mostly afraid that I'll just break my neck doing it, and I doubt they'll call 911. Crow pose is also out of the question, if you were curious. Too much temptation for dog-style identity verification. They're good dogs, and they've been taught the "polite nose" command, but they're not made of stone. Elphie, ever the precocious dog, also likes to compete. I do downward dog, Elphie sighs a deeply disappointed sigh and does downward dog, presumably to show me the correct way of doing it. 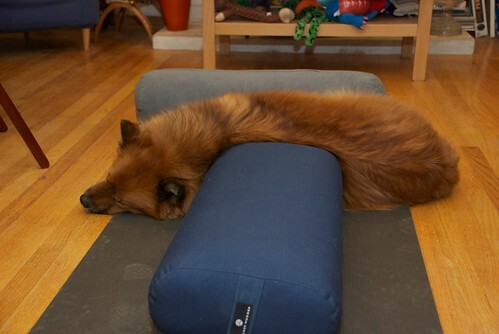 Same thing for upward dog. To be totally fair, she's way better at yoga than I am. But I'm working on that. Eventually, they get bored with the agility portion of the floor show, and wait for me to do something extended and uncomfortable (like hold plank), and that's when it's time for kisses. It's hard to keep your core strong while someone is licking your nose. Or elbow. Try it. I could put them out in the yard, or behind the dog gate; I just don't want to. That's reserved for when they really need to be out of the way, for their own safety. Yoga is just cooperative playtime. 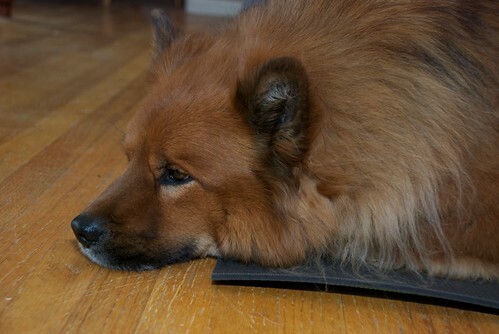 Plus, they've known not to walk on my knitting while it's blocking since they were puppies. They've got their priorities straight. My dog thinks yoga at home is a group activity as well, and 65 lbs of dog laying under me while I am doing downward dog is hard to displace! But Jasper "demonstrating" the "correct" (or doggy) way to do downward dog cracks me up every time. Ha, I've called my neighbors to the side "The Kravitz's" and I don't mean Lenny. Sometimes I'm happy to have cats (although chasing a cat, that is totally in love with handpainted yarns [and just handpainted....] around the house with your knitting still attached to the ball of yarn he is dragging around can be pretty challenging too! My dog mostly leaves me along until I get to the savasana stage, then he likes to come over and lick me in the face, presumably checking I've not died or anything from all that moving about, lol!